An attractive black large metal clock with a simple design. It incorporates Roman numerals with vint..
Wholesale large clock that is made of metal and the number that are set proud on smaller cog shaped ..
Wholesale Metal Wall Clock HUGE 76cm Diameter . Takes 1 x AA battery (not included). Product EA.. Pale Grey / Off White 110cm Vintage Metal Wall Clock Dimensions:H110 x W110 cmMaterial:MetalEAN:6490..
Pocket Watch Vintage Metal Wall Clock with Glass FrontDimensions: H78.5 x W60 x D6.5 cmMaterial: Met.. This all metal clock has a simple open back design with Roman numerals connecting the centre circle .. Stylish gold wall clock with a Roman numeral design. Has a handle on the top. Smaller clock is.. 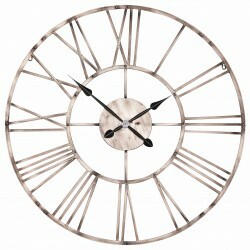 Stylish silver wall clock with a Roman numeral design. Has a handle on the top. Smaller clock ..
Rustic Large 110cm Metal Wall Clock Dimensions:H110 x W110 cmMaterial:MetalEAN:6490164077491Packing ..
Rustic Metal 76cm Wall Clock with Gold Hands Dimensions:76 cmMaterial:MetalEAN:6490164981385Packing ..
Silver Crown Wall CanopyDimensions H23 X W46 X D44 CMMaterial RE..
A stylish pocket watch wall clock. It has Roman numerals for numbers and the text read ‘KENSINGTON S..
A small compact design, that would fit perfectly in a variety of living spaces. The Border is made o..
An antique style telephone ornament with a working clock incorporated. The text on front of the cloc..